Not my best, but the sentiment is genuine. As we move into this final weekend before Christmas, I hope that all of your bulbs are lit, your presents are wrapped, and and none of your ornaments have rolled off and hidden under the couch. If you don’t have any of those things (or any of those issues, as the case might be), I still hope that you have a wonderful time this year, and enjoy the season however you find it. Best wishes from us to you, and here’s wishing you a fantastic New Year. Speaking of which, I just looked at the calendar and realized that this is the last TGIF post of 2015, so yes, Happy New Year as well. 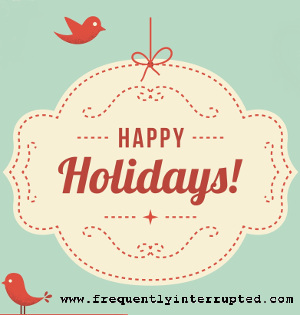 Next week, of course, is Christmas, so it will be another holiday week here at Frequently Interrupted. We’ll be posting Monday thru Wednesday, but Thursday and Friday will be reserved for family time. I hope you’ll do the same, if you’re able. Hug the ones you love and spread good cheer wherever you may go. So, a year in review? It’s certainly been a busy and full year for us. For starters, we had the launch of this site and everything that went along with that. We’ve been rolling for six months now, and the time just keeps flying by. We passed 120 followers on Facebook a couple weeks ago, and that number keeps steadily climbing. I don’t know what that rate is like for most such sites - we are not in competition here - but I’m happy with it. If people keep enjoying what we do, and it keeps being helpful, I’ll keep doing it. I would probably keep doing it anyway, but I might have been less public about it. Keep spreading the word, though, and I’ll certainly keep being public. We do have to pay for the electricity, and other related bobs and bits, though, so any help in that direction would be appreciated. Wander over to our Patreon site and help us out, if you are so inclined. Spread the word, because that always helps. I’ll be looking into some ideas come the new year. Advertising of some sort will probably happen, though I haven’t settled on the sort yet. I’m also considering selling some good, branded t-shirts, cups, and things of that sort. What do you think? Sound good, or any ideas you’d like to offer? Let me know, and I will be glad to look into any solid suggestion. I’ve been invited to participate in a Health and Wellness fair at my day job. I haven’t decided yet whether or not that is something I want to do, but the invitation is thrilling and certainly positive, regardless. I’m not certain that I am actually qualified to be the best presenter, and I’m not a big fan of public presentations in the first place, but I love the idea of helping to spread the word on mental health and wellbeing. If you have any thoughts on that one, feel free to let me know as well. The foster licensing proceeds in an orderly fashion. The requirements that can be completed have been. What’s left is waiting for scheduling and courts. I think, all in all, things are going quite well in that department, and I thank you for all of the support and positive sentiments that have been sent our way. The licensing portion should be complete in the first part of the year, so that is something exciting to look forward to. I started writing Frequently Interrupted to help me deal with what was, to be honest, not being a good year up to that point. I was struggling, and needed some ways to get a handle on my own demons, because those demons were getting loud. I feel so much better going into the end of the year than I did at the beginning of the year, and I am glad that you have come along with me on this journey. For those who are curious about such things, I have even written a few pages of fiction for the first time in I don’t even care to think about how long. The journey is just beginning, and I hope you will stick around and see where we go. Bring some friends, and let’s make it a social event. Merry Christmas and Happy Holidays to everyone out there. I hope you have the best season possible, in whatever way you celebrate the season. Make it great, and let’s kick off a wonderful New Year while we’re at it. See you next time.